Michael Gove has endorsed the Conservatives’ Aberdeen South general election candidate as the “breath of fresh air” the constituency needs. The leading Brexiteer said Ross Thomson was “dedicated heart and soul” to fighting for the area and accused the SNP of not being interested in standing up for the north-east. Mr Thomson, who also campaigned for a Leave vote last year, agreed a voice “shouting from the sidelines” was not enough. But the SNP’s Callum McCaig, who held the seat until the Westminster Parliament was dissolved yesterday and is standing again, accused the pair of “empty soundbites”. And he said it was “hardly a surprise” that “one extreme Brexiteer” was backing another. Meanwhile, Labour’s candidate, Callum O’Dwyer, described the endorsement as “nothing but a bad omen” for his rival. 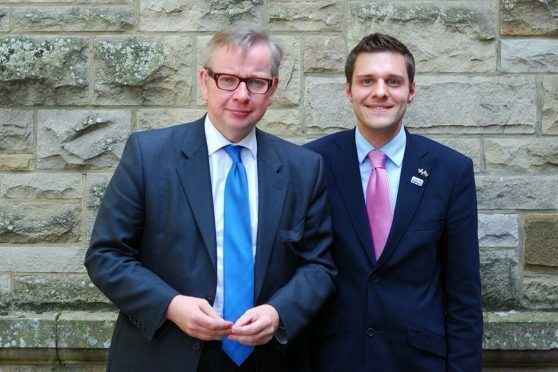 Mr Gove, who was raised in the Granite City and attended Robert Gordon’s College, told the Press and Journal: “Ross Thomson is the breath of fresh air Aberdeen South needs. “He is a highly talented, very energetic and immensely principled campaigner who’s dedicated heart and soul to fighting for the city he loves. “The SNP aren’t interested in standing up for Aberdeen and the north-east, they’re only concerned with playing games on the constitution. North East MSP Mr Thomson welcomed the former UK justice secretary’s comments, adding: “I agree that Aberdeen needs a strong voice at the heart of government to get a better deal for this area – not one shouting from the sidelines. Mr McCaig said: “It is hardly a surprise that a member of the Tory party is backing a Tory, particularly when it is one extreme Brexiteer to another. Mr O’Dwyer added: “The last time Michael Gove backed someone it was Boris Johnson – before he stabbed him in the back.